EDITOR'S NOTE: The two Aspire models announced earlier this month at IFA replace last year's 15.6-inch Aspire R7-572 model, which we reviewed here. BERLIN - Acer has announced the Aspire R 13 and Aspire R 14 Series, two new convertible notebook lines that can transition between various notebook and tablet style modes of operation. The R 13 Series features Acer’s Ezel Aero hinge that allows the display to rotate into six different positions. All models can also be used with the optional Acer Active Pen. 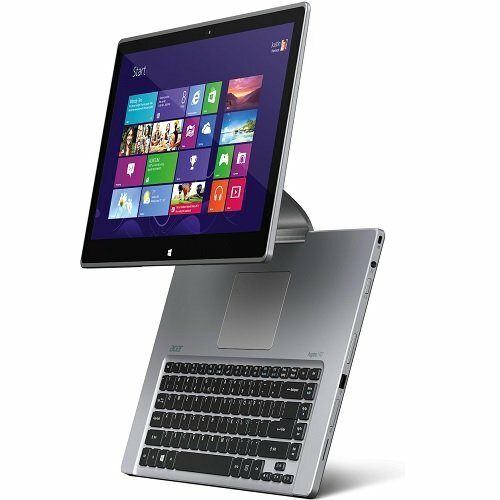 The R 14 Series of convertible notebooks features a 360 degree dual-torque hinge that allows it to be used in four usage modes. Both notebooks are designed for those who don’t want to give up a traditional notebook design, but want more options and flexibility. Both the R 13 Series and R 14 Series were unveiled today at Acer’s Global Press Conference at IFA 2014 in Berlin, Germany, where the company announced their entire line of holiday products. They can be viewed at the Acer Booth in Berlin Messe (Hall 12/101), which will be open to the public from September 5-10. Less than 1 inch thin and just over 3 pounds (1.5 kg), the lightweight Aspire R 13 Series incorporates the inventive Acer Ezel Aero hinge that provides both flexibility and stability. The 13.3-inch display is affixed to this special hinge at the sides, which allows the screen to rotate 180-degrees so it can be used in six different ways. This quick and effortless way to transition between various modes gives it the productivity features of a traditional clamshell notebook with the convenience of a tablet. 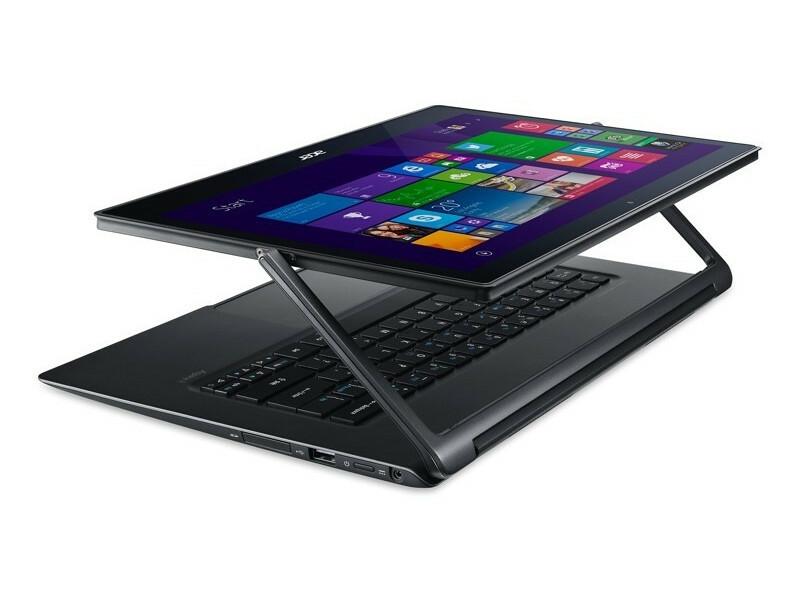 Acer’s patented dual-torque system hinge keeps the display stable and in place when touch navigation is used. It is attached to a forged U frame, which also helps to enhance stiffness while maintaining the notebook’s slim design. Notebook mode - provides a precise and spacious keyboard for maximum productivity. Ezel mode - brings the display close for convenient reading and web browsing. Stand mode - makes it easy to draw a flow chart, take notes, brainstorm with others or edit artwork. The stand is sturdy enough for drawing and other touchscreen interactions. Pad mode - enables the R 13 to be used as a tablet for web browsing, playing games or watching videos. The screen fits perfectly in the chassis frame, so it’s steam-lined and easy to hold. Tent mode - the ideal position when space is limited, such as an airplane’s seatback tray. Display mode - good for viewing photos and video or playing games with others. The Aspire R 13 is crafted to last and packed full of cutting-edge features. The touchscreen and outer lid are both encased in a slim, but strong, sheet of Gorilla® Glass 3, making them tough yet beautiful. All R 13 Series models offer premium touch screen displays with super crisp images and fine detail. Available in either super high-resolution (WQHD) (2560 x 1440) or full high-definition (FHD) (1920 x 1080), photos, videos, games and presentations are strikingly vivid and detailed; text is sharp and crystal clear. Both display options include Zero Air Gap Technology, which ensures vivid, lifelike visuals. It reduces reflections, heightens contrast, creates bright and crisp images and improves readability in sunlight. FHD models feature IPS technology, which provides wide viewing angles, making them ideal for sharing movies and photos or for work presentations. In addition, anti-fingerprint technology helps eliminate smudges and makes the displays easier to clean, while anti-reflective technology minimizes reflections and improves the display’s contrast. A built-in light sensor automatically adjusts the screen’s brightness to enhance the screen image, making it easier to see and read based on the ambient lighting in the room. The R 13 Series can also be used with an optional Acer Active Pen for drawing, creating and collaborating. The pen comes with a pressure sensor for professional drawing and a hover sensor for easy access to functions. It also supports palm rejection so users can write on the screen comfortably. With great accuracy and sensitivity, the Acer Active Pen can be used as a computer mouse, with the upper and lower buttons serving the same functions as the left and right buttons on a mouse. The pen works with Acer’s exclusive pen-enabled software, Acer Hover Access, which is pre-installed on all models, and features several innovative applications for work or play: note-taking, painting and editing. Simply hover the pen closely over the display for the sensor to detect, and then click on the pen’s side button to launch apps: Acer Screen Grasp, as well as Microsoft OneNote, Windows Journal, Microsoft Sticky Note and Microsoft Fresh Paint. Acer Screen Grasp - allows any image to be easily captured, personalized and shared to social networks or pasted to documents. Acer AccuFinger - helps accurately place the cursor in text documents and acquire tiny items on the screen when using fingers. The pen and software make using the R 13 convenient, fun and productive in 3 easy steps: Hold the Acer Active Pen above the screen and the Acer Hover Access software will automatically detect the pen; click the button on the side of the pen; launch apps to write notes, paint or edit. In addition to its innovative features, the R 13 Series includes powerful technologies, making them fast and responsive for a wide variety of work and entertainment uses. For maximum performance, models offer Intel Core i5 or i7 processors, up to 1TB2 Solid State Drives with RAID-0 support and up to 8GB of memory. Leading audio features include Dolby Digital Plus Home Theatre for cinematic surround sound, and Acer Purified Voice, a combination of hardware (dual-array mic) and software (voice recognition and audio processing). It is also Skype™ certified, which ensures webcam/video chats, conference calls, VoIP calls and voice commands are always crystal clear. To keep the powerful R 13 running cool and quiet, the Aspire R 13 boasts an advanced dual air-intake design for comfortable and noise-free computing. For all day computing, models with a FHD display deliver up to 8 hours3 of battery life. The Aspire R 13 Series will be available in October in Pan America with prices starting at $899.99 (USD), in November in EMEA with prices starting at €899, and in Asia. Acer’s new R 14 notebook makes it easy to play, share, display or work. Its clean, refined design incorporates a 360 degree dual-torque hinge design that allows effortless transformation into four different modes for productivity and entertainment needs -- notebook, pad, display or tent. Notebook mode - the most efficient way for work and productivity; ideal for vast amount of keyboard input. Display mode - brings the screen closer for watching movies; it can also be used as a large photo frame. Tent mode – perfect for smaller spaces, such as the fold-down tray on an airplane or on a kitchen counter. Pad mode – for use as a tablet, Internet browsing, playing light games, sharing information. Acer’s inventive 360 degree dual-torque hinge design delivers the perfect combination of flexibility and strength, making it easy to change modes with one hand for a wobble-free touch experience. Constructed of strong zinc alloy and soft rubber, it provides durability and the perfect amount of touch resistance. In addition, the hinge design allows the lid to be laid completely flat without any gap between the chassis and lid. Collaboration and sharing are made easier when the display is laid completely flat. In tablet mode, the display can be flipped over and lays completely flat against the chassis as well, for a clean, streamlined design. When the notebook is used in display mode, the hinge slightly raises the entire system, preventing the keyboard from touching the table or other surface. For convenience, the images and audio on the R 14 automatically reverse channels when the modes are switched, so the visuals and sound are always aimed the right way. The R 14 features a 14-inch HD (1366 x 768) display with Zero Air Gap technology, which helps to eliminate reflections in sunlight, resulting in higher contrast and crisper images. It also supports Acer Touch Tools that helps the user capture, collect, write and share screen data effortlessly through touch. Models are available with a range of Intel processors, including Pentium, Core i3, i5 or i7, and can be configured with up to 12GB of memory for powerful performance. Some models offer NVidia® GeForce® 820M graphics to enrich the overall visuals. Roomy 500GB2 or 1TB2 hard drives provide ample storage for files, photos and videos. Skype Certified, the R 14 provides crystal clear communications with uninterrupted audio and visuals free of echos, gaps and lags, making it easy to connect with friends, family or co-workers across the globe. The Aspire R 14 Series will be available in October in Pan America with price starting at $599.99 (USD), from mid-October in EMEA with price starting at €499, and in Asia. 1) Specifications vary depending on model. 3) Actual battery life varies depending on product specifications, computer settings and applications or features launched. All batteries’ maximum capacity diminishes with time and use.